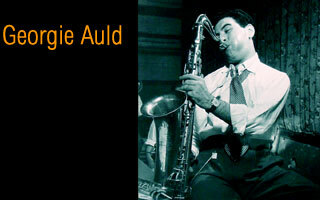 Georgie Auld CDs @ Hep Records, jazz in depth from the 1930's to the present day. Georgie Auld, (John Altwerger), was born Toronto, Canada on May 19, 1919. His family moved to New York in the early thirties and George, by now playing alto saxophone, soon began to get noticed. After exposure to the playing of Coleman Hawkins he switched to tenor and got his first taste of the big time when he joined Bunny Berigan's orchestra in February 1937. He stayed with Berigan till December of 1938 when he and drummer Buddy Rich left to ignite the highly successful Artie Shaw band. It was with Shaw that his supercharged style became his trademark. When Shaw disbanded in November 1939 Auld was elected to become leader but it didn't work. Benny Goodman reformed in late 1940 and Auld became the featured hot tenor man. His main jazz opportunities came in the Goodman septet that also included Cootie Williams and Charlie Christian. His boiling Hawkins inspired tenor combined with Cootie and Charlie to give the Goodman small group real heat. He left the Goodman band in the summer of 1941 and briefly worked with Jan Savitt. Then the call came from his old boss Artie Shaw who was about to launch one of the most interesting bands of the era with Hot Lips Page, Dave Tough, Ray Conniff and fifteen strings, but it only lasted a few months due to America's entry into the Second World War. He was medically unfit for military service and formed the first of a series of modern sounding big bands and employed many soon to be famous bop musicians. But business was not good and by 1946 he disbanded. The '44 band is heard in a blues drenched Basie style programme of transcription performances, and a 1945 broadcast on Hep CD 27 "Jump Georgie, Jump". 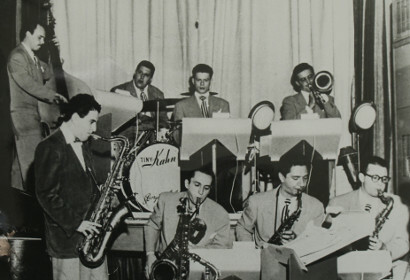 In 1947 he led a combo which included Tiny Kahn, Red Rodney, and Gene Roland. He later had another boppish group on the west coast with trombonist Billy Byers in the ranks. In the years 1950-60 he worked extensively in recording and film studios and made many albums both as sideman and leader. He played a convincing cameo role in the 1977 Robert de Niro/Liza Minnelli film "New York, New York" and ghosted for de Niro's playing. He also appeared in clubs around Los Angeles. His vigorous style had mellowed and many of his later albums were successful examples of very superior mood music. Auld was one of the most distinctive tenor sax voices of the forties and a committed leader who tried to make it in the postwar twilight time for big bands. He died in January 1990. Georgie Auld - "Short Circuit"